Ever since we learned that Sonam Kapoor and Kareena Kapoor Khan were coming together for Veere Di Wedding fans have been eager to know more. Also starring Shikha Talsania and Swara Bhaskar, the film, directed by Shashanka Ghosh, is a high spirited and upbeat story that talks about the lives of four childhoods best friends Kalindi, Meera, Sakshi and Avni. Recently, the cast shot for a peppy number for the film, which will be a promotional song. 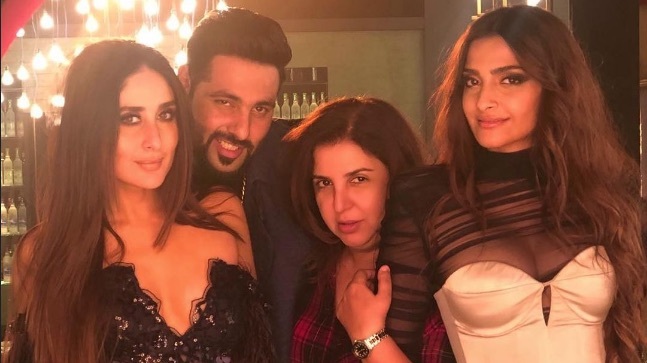 Sonam Kapoor, Kareena Kapoor Khan and Swara Bhasker, were joined by choreographer, Farah Khan and rapper Badshah on set for the shoot. Sonam and Kareena looked Uber stylish of course in their outfits, posing with Badshah, Farah captioned the image, “Killing it with @sonamkapoor @badboyshah n #kareenakapoor! @vdwthefilm @rheakapoor #fiercenessoverload”. If that was’t enough good VDW news we hear that the trailer of the film will be out next week on 18th April 2018, with the theatrical film set to release on 1st June 2018.